Garth Brooks has friends in the right places, some of them at Cavender’s Boot City on Central Expressway in Plano. Seems that the king of country rock wanted to look especially sharp last year in Dallas, and the long tour had been wearing out his stage garb. Being very familiar with Cavender’s—he’d shopped at their stores before and wore one of their private label shirts at a Country Music Association awards night—Brooks had his manager call up the western wear retailer for a special shopping spree and fitting. The Cavender’s crew was understandably thrilled to oblige, and it was a stylish Brooks who tore up the venue in Big D.
Thompson is just as proud to have other luminaries from the country music world make their fashion statements through Cavender’s attire. The huge selection can bring out the cowboy and cowgirl in anyone, or simply add a tasteful western touch with an accessory or piece of jewelry. Something deeper than just fabric is at play, he believes. 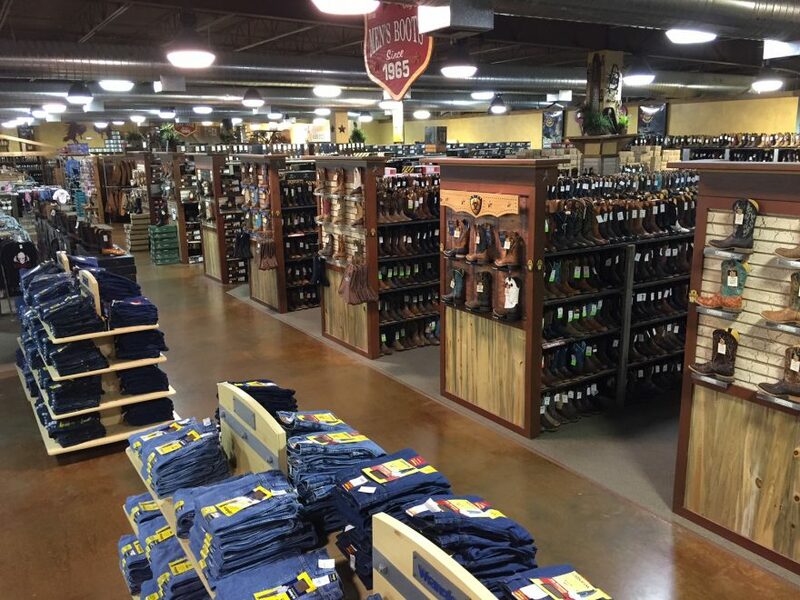 And, he’s quick to say, Cavender’s doesn’t just want its customers to wear its attire—it wants them to experience it. He sure does, and says the same holds true for most of the folks who work for the retail chain that boasts around 80 stores in Texas and 10 in other western and southern states. A spry 60-year-old with a zest for Texas living despite his upstate New York upbringing, Thompson can attest to the necessity of durable clothes for ranch work. He owns a 100-acre spread with 50 head of cattle northeast of Tyler. A fringe benefit of being the Cavender’s fiscal boss is access to a line of work clothes that can endure any sweat test. Texas summers may be stifling hot, but Thompson still needs sturdy shirts that will protect his arms from barbed wire. Rugged, and perhaps even snake-proof boots are prudent whatever the month. A straw hat is a necessity from April to September, with a felt hat advisable during what can be a raw Texas winter. The jeans had better stand up to a day in the field and a rugged washing afterward. Other folks who toil in the blue-collar world would agree. Pumping is on the increase at the Lone Star State’s oil fields, and the crews need duds that are built to last. 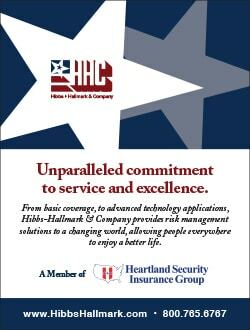 Given the occupational hazards, the oil field workers often opt for the flame-resistant shirts, jeans and jackets that Cavender’s stocks in ample supply, and may be required by OSHA regulations. Cavender’s will even customize commercial accounts by offering such benefits as centralized billing, voucher acceptance and volume pricing. 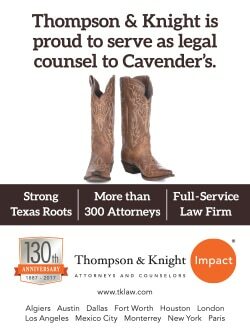 Texans, of course, are known for working and playing hard, and Cavender’s aims to provide them with attire fit for any occasion, while also expanding the business outside its base. Always in style regionally, western wear seems to go in and out of vogue elsewhere, Thompson explains, adding it’s often subject to such factors as which movie or entertainer is hot. While the popularity of country artists like Kenny Chesney helps sustain a strong market for men’s clothing, Taylor Swift, at least initially, was a blessing for women’s sales, her earlier work fusing pop and country, and dressing the part on stage. 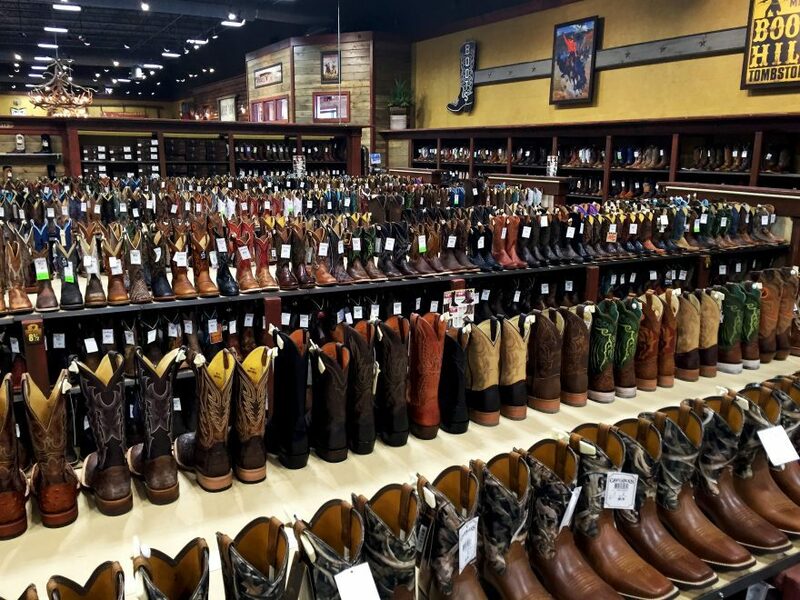 The cyclical national popularity of western wear has Cavender’s in a prudent growth mode. Its online operation may rope in consumers from every corner, but the chain isn’t rushing to plant stores in uncharted territory; its westernmost point being Albuquerque, New Mexico; to the north, Centennial, Colorado; and to the east, Huntsville, Alabama. 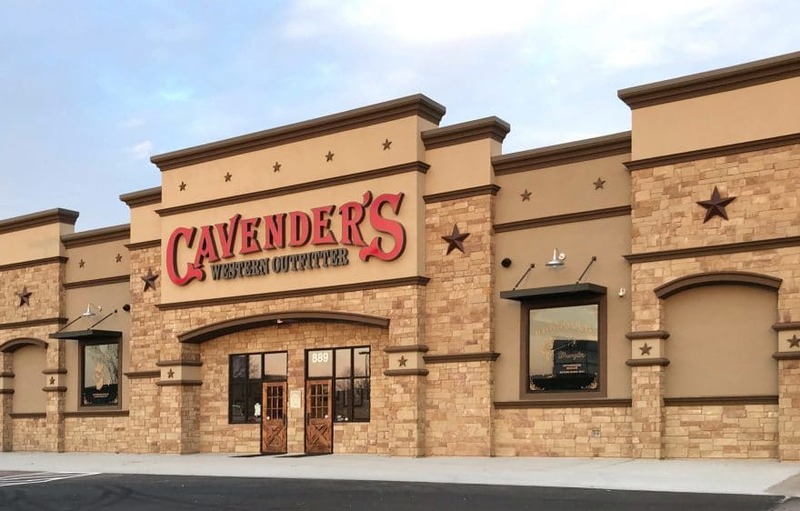 He explains that Cavender’s prefers to own its locations, and at least in regions where the chain is strong, the sprawling stores are around 20,000 square feet. It takes time to consummate such a real estate deal, Thompson says, and a careful risk-benefit analysis must be part of any expansion plan. But that’s always a matter of concern to any CFO, says Thompson, who earned his Master’s in accounting from Texas Tech after graduating the State University of New York at Plattsburgh. He worked in public accounting for several firms before becoming vice president of finance for Celebrity Inc., from 1987 to 1997. He grew the small wholesale flower company into a powerhouse, including several acquisitions and a public offering, while spending much time in Asia. Such experience made him an attractive candidate for Cavender’s, then an operation with 36 outlets. And the western lifestyle seemed more exciting than selling flowers. His wife, who earned an MBA at Texas Tech and enjoys barrel races, would agree. 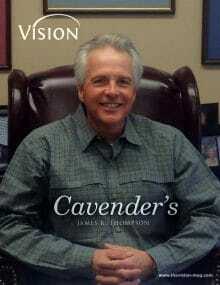 Their two children have never known a world exclusive of the Cavender’s experience. As a tot, his son aspired to be a bull rider, at least until dad placed him on a sheep that bucked him into a puddle. “That’s when he decided he’d like to be a team roper,” Thompson says. Outfitting the boy was easy enough—another benefit of his dad’s affiliation with Cavender’s.